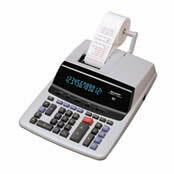 The VX-2652H is a quick and quiet 12 digit print/display calculator with a stored memory tax rate key and 2 individual 4 key memory banks. In addition, it has a large, easy-to-read 17 mm display. are designed for fast and comfortable operation. Extra ease is provided by contoured Plus/Equal and Minus/Equal keys. prints 12 numerals, 2 symbols, and 3-digit punctuation at a speedy, approximately 4.8 lines/sec. in 2 colors (positive numbers in black, negative numbers in red) on standard size paper rolls. Dimensions: 9 27/32"(W) x 13 19/32"(D) x 3 1/16"
This page is part of GeneralManual.Com Network SHARP VX-2652H Commercial Calculator User Manual.